This is a very good movie! Jim Sturgess plays Ben Campbell, a seemingly "nerdy" student at M.I.T. in Boston. His goal is to win the $300,000 scholarship necessary for him to attend Harvard Med School. Ben has a mundane job and is working his way through college, but there is really no question, that without the scholarship, his dreams will likely never be realized. Professor Rosa, played by Kevin Spacey, is Ben's Math teacher, who is very impressed with Ben's ability to think quickly under pressure. A chance exchange between Ben and the Professor leads Ben to be recruited into a select group of Professor Rosa's students who spend their weekends in Las Vegas, with the Professor, "counting" cards at blackjack tables in some of the biggest casinos. They are very successful, but "odds", being "odds", are never a sure thing. Teammate Jill Taylor, played by Kate Bosworth, and Ben, develop a romance, which is completely against the "rules" of the team. Emotions color the ability to calculate, causing problems, which the Professor, himself a former "card counter", has warned the team about. But youth is folly, and as Ben's love for Jill grows, he loses his restraint, falling victim to greed. This brings about the downfall of the "team", for which Ben is penalized by losing all the profits he has made on the weekend gambling trips. In short, he is now, once again broke. "Teamates" Choi, played by Aaron Yoo, and Kianna, played by Liza Lapira, all give credible performances in this fast paced and unusual drama as the team draws the attention of "the eye in the sky", that vast array of security cameras which adorn all major casinos, searching for "teams", just like this one, "counting cards." Casino Security members Cole Williams, played by Laurence Fishburne and his partner Terry, played by Jack McGee are excellent as the casino security team who have seen it all before. As a matter of fact, through the magic of facial recognition software, they even know the Professor, who has been banned from every major casino in Vegas. 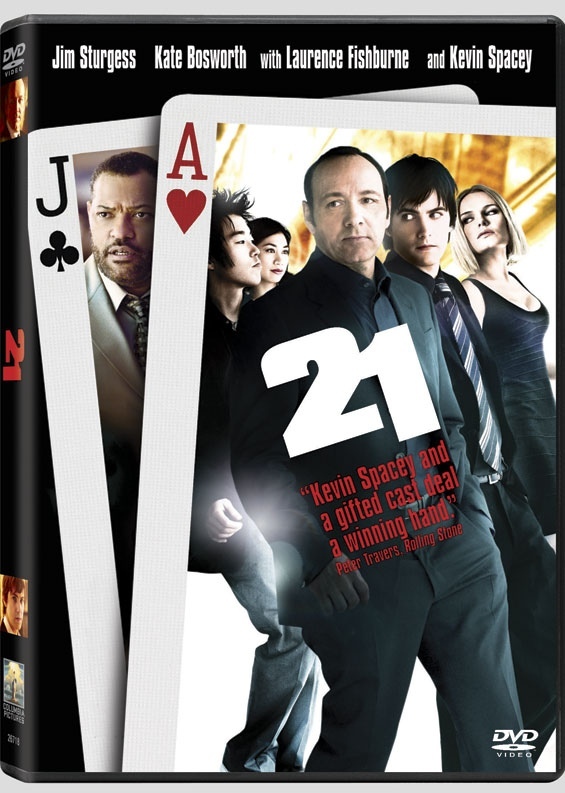 As Ben bounces back and forth between the two world's of being a student in Boston during the week, and playing a dot com millionaire in Las Vegas on weekends, the odds quickly shift from the cards to the heart of human nature. When he is finally busted by the security team, he is forced to make the toughest decision of his life. A surprise twist rounds out this quirky, and off-beat drama, where everything is just as it seems, but somehow not quite the way it should be.